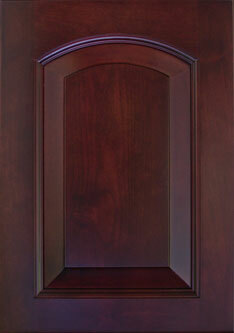 Same elegant styling as the square Hometown Raised Panel door, but with an arch as an added accent. Finished with rich, Merlot stain as shown. Also available unfinished. Option choices are restricted for this BARGAIN FAVORITES selection. For more option choices, CLICK HERE. Important: All computer monitors and printers are different, so the colors may not come out exactly as pictured. Read FAQ for information on spray stains (SS).